It’s the middle of February and you’ve probably noticed store displays full of various sized hearts, pink everything, and chocolate as far as the eye can see. That’s right, Valentine’s Day is almost here again. A romantic holiday can be lonely for the newly divorced, but there are still ways to celebrate and have a memorable experience with your kids. You obviously don’t need what many view as a Hallmark holiday to remind your children how much you care. But it never hurts to take every available opportunity. 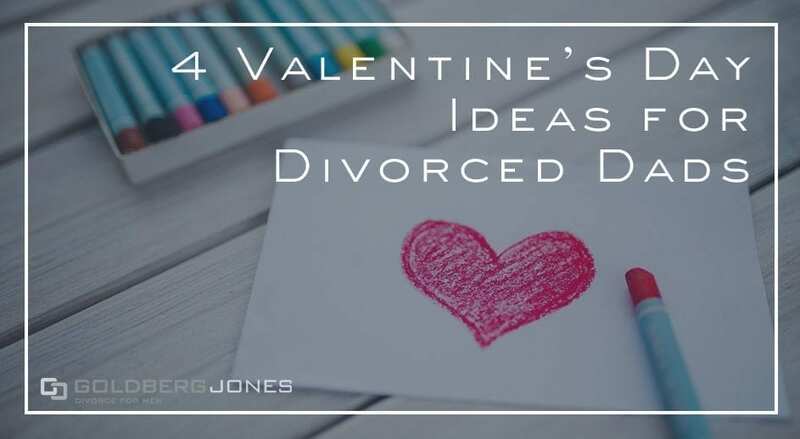 With that in mind, here are few ways for divorced dads to celebrate Valentine’s Day with the kids. It’s all too easy to wallow in misery and depression if you’re single and recently divorced on Valentine’s Day. So, make it about the kids. Focus on your children, listen to what they want to do, and give them a fun memory they can hold onto down the road. Are heart-shaped pancakes your specialty? Do your kids crave your spaghetti above all other foods? You can hit up their favorite Chinese restaurant or local wood-fired pizza joint. Whatever form it takes, consider sharing a special Valentine’s meal with you kids. You never know, you may start a new annual tradition. You can craft hand-made Valentine’s for each other, cook an elaborate meal together, tackle an art project, or build an end table if carpentry is your bag. Creative activities are a great bonding experience. Again, the important part of all of whatever you try is to do it together. That’s the key here. These are obviously just a few ideas for fun ways to approach this February 14. Again, you don’t need a holiday to show your kids how much you care, but it never hurts, even if it’s with a corny store-bought card. If you don’t get to spend the day with them, even a quick phone call or text message can be a reminder you’re thinking of them. What are your favorite Valentine’s Day activities to do with the kids? Sound off in the comments below.